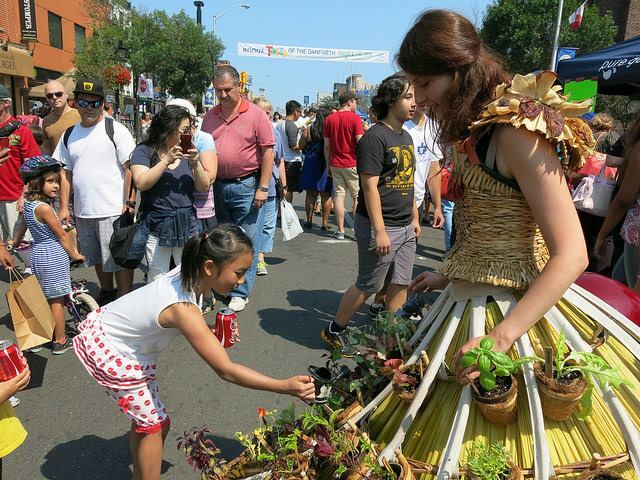 The Mobile Garden Dress, part of the Urban Foragers series, participated in the first Eco Art Fest in Toronto during the summer of 2014. This new outdoor festival situated at Todmorden Mills is presented by No 9 Contemporary Art and the Environment, an arts orga­ni­zation that uses art and design to bring awareness to envi­ron­mental concerns. 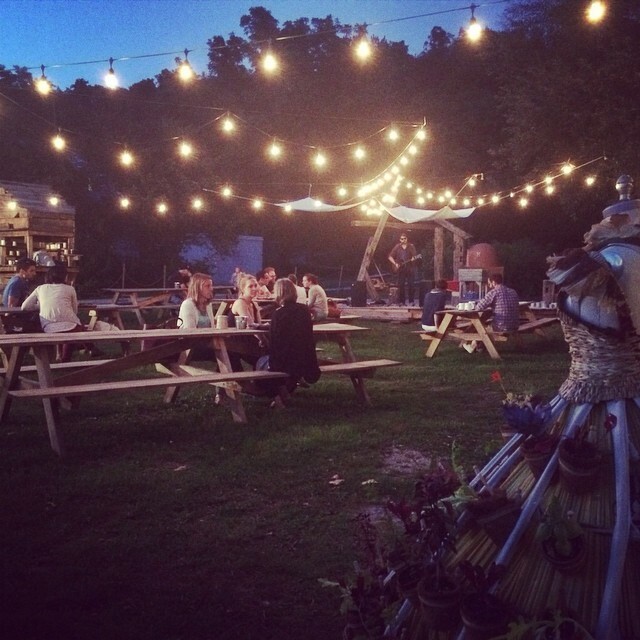 It featured 8 public art installations hidden throughout the site, live music, homemade organic dishes, beer and wine. Plus Public Art tours, Watercolour Painting Workshops, Sustainable building workshops, and Clay Stein Making. The Mobile Garden Dress was on hand at all the events onsite and she also traveled around the city to the Brick Works Farmer’s Market, the Taste of the Danforth and to Queen Street. It’s been a busy summer for this Urban Nomad! The dress was worn by several models whom i met and trained at the beginning of the project. Special thanks to horticulturalists Deena Del Zotto, Rachel Kimel and Wendy Woodworth for growing and taking care of the plants! My work is listed as 1 of 12 best artists in the book in an article by The Guardian. I also read a review of the book in the print edition of the Art Newspaper while sitting in a café during my visit to Art Basel in Switzerland in June 2014. After working in relative obscurity for years it is nice to know that the art and ecology movement is gaining some legitimacy in the art world and that my work is being counted among these amazing artists worldwide. 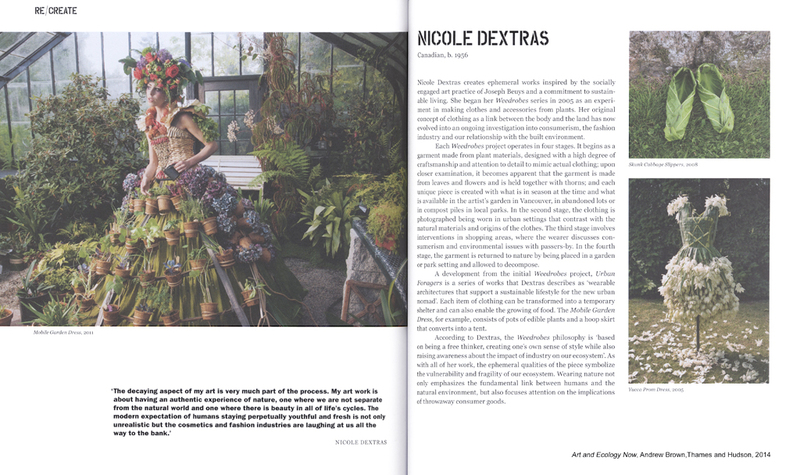 My work is featured on pages 198 and 199 in the Re/Create section plus there is also an image of View in the introduction on page 7. The book moves through the various levels of artists’ engagement, from those who act as independent commentators, documenting and reflecting on nature, to those who use the physical environment as the raw material for their art, and those committed activists who set out to make art that transforms both our attitudes and our habits. It includes at 10 page introduction: ‘At the Radical Edge of Life’ by Andrew Brown, 6 chapters: Re/View, Re/Form, Re/Search, Re/Use, Re/Create, Re/Act plus a Further Reading list. 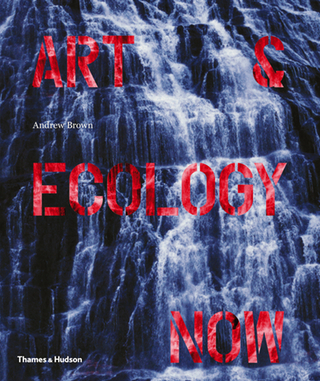 Finally a book that deals with the complex breath of the environmental art movement by adding fresh voices to the topic.